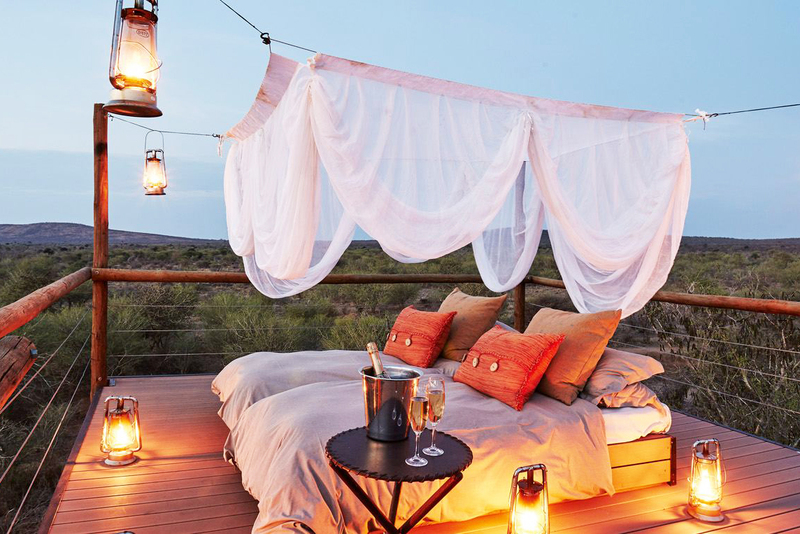 Whether you want to be soothed by a lullaby of roaring lions under a canopy of stars in Africa, or soak in a New Zealand sunset in a cedar hot tub, we’ve rounded up 11 of the most incredible glamping experiences from around the globe. In a time when people are looking to swap nights in multimillion dollar resorts for simpler digs among nature, ‘glamping’ – glam camping – is more in vogue than ever. From sleeping in recycled buses in Iceland, to nestling in Hobbit pods in North Yorkshire, England, glamping has come to be just as much about the unique experience as it is about sleeping outside. So pack away the all-inclusive hotel deals and opt for an experience that’s a little closer to nature, and more authentically aligned with your destination, but still an upgrade from a swag or tent in the bush. These 11 glamping experiences are sure to take your breath away. The mountainous terrain around Esjan is an excellent location for hiking, trekking, nature walks and swimming; a pleasing discovery for lovers of the outdoors. The accommodation here is the very definition of unique; guests sleep in self-contained recycled buses. The big bus windows allow guests to engage with the stunning natural environment. Each bus features cookware, bedding, towels and a rustic interior inspired by the Icelandic wilderness. From here, you can make day trips to lava fields, hot springs and the famous Blue Lagoon. This 25-acre glamping site is situated amongst olive groves in wildlife-rich Hidden Valley Andalucía in Spain. Six secluded bell tents, which overlook the national park’s extensive valleys, are equipped with ‘real’ beds and furnishings. Continental breakfast included or you can choose a hot breakfast (from $10). Communal kitchenette and toilets. The site is perfect for horse riding and there’s an abundance of mountain biking tracks to explore. The Costa del Sol is home to incredible beaches such as Malaga, Fuengirola and Estepona, just to name a few. Hidden Valley is only 50 kilometres from Malaga’s marina, golf courses, historic castles and there’s an observatory for star gazing. This is technically not purely ‘glamping’ in the strictest sense because Camp Katur also has slightly more permanent structures, but the accommodation here is unlike anything you’ve ever seen. The site on beautiful Camp Hill Estate between Ripon and Bedale in North Yorkshire. You have a huge range of accommodation options ranging from bell tents and tips to ‘Hobbit pods’. The woodlands also hide Unidomes, glass-roofed domes which are ideal for stargazing and taking in the surrounding flora. Each pod comes equipped with gas heaters, cushions, candles and fairy lights inside, and barbecues, fire pits plus a communal pizza oven outside. There is a fully stocked communal kitchen and communal shower blocks. Plenty to keep you active, from quad biking to Segway tours and wine tasting to yoga classes. The Old Forge Glamping is set in the grounds of a Georgian farmhouse, overlooking Lugnaquilla, the highest peak in the area. Amongst the rolling countryside, you may stumble across long-eared barn owls, deer, foxes, badgers, pheasants and ducks. The campsite has four yurts as well as a log cabin. Each individually decorated yurt has a double and two single beds, its own barbecue and campfire area. There’s a fully stocked communal kitchen inside a 17th Century granite farm building complete with wood stove. Shared bathrooms. Nearby activities include woodland walks, falconry displays, plus you can visit a neighbouring ‘chocolate garden’ and Huntington Castle. If you’re looking to be with nature in the splendour of California’s Big Sur, but also want luxurious amenities, a stay at the Ventana Redwood and Canyon glamp sites is just what you’re looking for. There are two glamping campsites, Redwood and Canyon, both featuring safari-style canvas tents with custom designed beds, a fire pit and luxury bathrooms with heated floors and marble vanities. For total seclusion choose the Canyon glamp site (only accessible by foot). Each glamp site has electric blankets, a fire pit, power outlets, an outdoor seating area and walking poles are available. The brand new Bath House comes complete with hotel-style amenities including teak-enclosed showers and heated floors. Try yoga classes, photography walks, charcoal drawing classes and there’s a network of hiking trails to keep guests busy. Just 10 minutes from the west entrance of Yellowstone (the Montana side), the “luxury lodging” camp is secluded enough for solitude but also close enough to the national park for action. Five tents onsite. Three luxury tent options, each sleeping up to four people, with private bathrooms, king size beds, private decks and wood stoves. The other two tents share a communal bathhouse. On-site restaurant (eat in or takeaway). Each tent is fitted with luxurious linen. Hot breakfasts included. Activities include kayaking, white water rafting, mountain biking and zip-lining. You can also book multiple-night Yellowstone adventure packages. From $264 per night (for two people). To book, head to undercanvas.com. Under Canvas also operates glamping sites near other grand US national parks: Grand Canyon, Moab, Glacier, Zion, Great Smoky Mountains and Mount Rushmore. Located in the heart of the Canadian Rockies, Sundance Lodges offers comfort camping in beautiful canvas tipis – a far cry from your average outdoor experience. The campsite is located in Kananaskis Country in between Calgary and Banff. There are two glamping options available. The beautiful Sioux canvas tipis are hand-painted with First Nations-style designs. The trapper’s tents come with their own deck and awning to shelter from the elements. You can hire bedding or bring your own. Inside, each tipi has wooden floors and wood-frame beds, heated and lit by kerosene heaters and lanterns. Outside there are picnic tables and fire pits. There’s shared showers and laundry with basic groceries available from the gift shop. Pet friendly. With the Rockies at your door step, there is a range of activities available such as hiking, rock climbing, biking, swimming and white-water rafting. At night you might even catch a glimpse of the Northern Lights while star gazing. EcoCamp Patagonia is an award-winning sustainable hotel which opened in 2001. Visitors can connect with nature while still enjoying modern amenities at this more than comfortable oasis in the stunning Torres del Paine National Park. Hellooo glamping! Forget tents, here it’s all about the eco-friendly domes, which are connected by wooden boardwalks. Some feature skylights for serious stargazing. To keep cosy in the Chilean Patagonia each dome comes with propane heaters, wood stoves and well insulated walls. In keeping with the green theme, use the composting chambers for your scraps. There are communal domes to congregate in which double as a bar and yoga studio. Activities include hiking tours, cycling, fly fishing and wildlife safaris. EcoCamp can organise a range of multi-day treks in Torres del Paine National Park. This magical glamping spot is literally situated among sand dunes in the middle of the Sahara Desert at Merzouga. By day, the Sahara colours sparkle in the sun; by night lanterns come alive to light up the pure darkness. Three styles of campsites are available, each set within sand dunes. Inside, each tent is decorated with regional wooden furniture and traditional colourful fabrics. The tented restaurant provides traditional three-course dinners, which can include typical Moroccan fare such as lamb mechoui or seven-vegetable cous cous. In the evenings, your hosts will wow you with traditional music around the campfire. Camel trekking through the desert is a must, as is a visit to a local Rissani market. And hop aboard a 4WD trip through the dunes with one of the camp’s experienced drivers during the day; then listen to your guide’s stories around the campfire at night. If your soul is set alight by luxurious accommodation, exceptional cuisine and thrilling game viewing, then a glamping trip to the Sanctuary Makanyane Safari Lodge in South Africa should be high on your hit list. Set on a 1,800-hectare private reserve, this is a once-in-a-lifetime experience. Sanctuary Makanyane has air-conditioned suites on the Malaria-free Madikwe Game Reserve, which is home to lions, leopards, elephants, buffalos and both black and white rhinos. The luxurious suites have open-fronted lounges, private sundecks and spacious bathrooms. 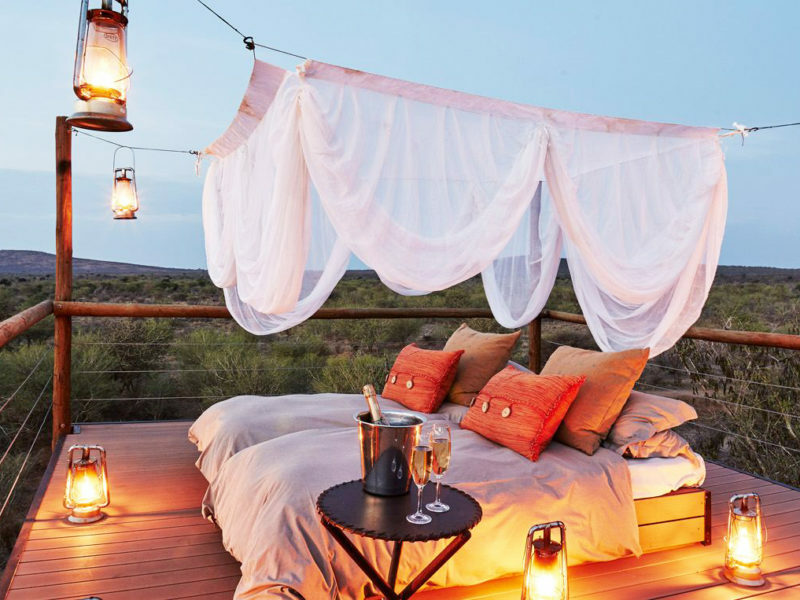 The sleep-out under the stars option (raised to keep you apart from the wildlife) is replete with romantic lanterns and cushions for a luxurious lay-about on the deck; ideal for a spot of sunset wildlife viewing. The private bathrooms feature roll-top baths plus both inside and outside showers. The retreat has an extensive wine list (all house wines are included in the rate). You can’t head to a safari retreat in South Africa without taking part in game drives. But for something different, Sanctuary Makanyane offers game walks in the footsteps of the Big 5 headed its experienced guides. New Zealand is strewn with incredible landscapes and picturesque natural havens, which many explorers simply don’t know about. Canopy Camping provides a curated collection of special places of the glamping kind, ranging from super luxurious to simple and rustic. All you need to do is choose one. Whether you prefer a simple timber riverside abode or a canvas-lined luxury homestead, there is something for most travellers. Our pick? The cliff-top Woodpecker Hut, located on the north-west coast of the South Island, features your very own open-air cedar hot tub to soak in the dazzling coastline vistas. Differ from place to place, but each glamping site has a sense of refined luxury. Woodpecker Hut is good for relaxation, exploration and, of course, long hot soaks in that tub.